Whoever said American football supporters aren’t very passionate about the game might have been dead wrong, especially when it comes to national team manager Bob Bradley. It seems everybody has a strong opinion on the US coach, and it is leading to a series of hot debates across the country. There is even a website devoted entirely to Bradley’s shortcomings as a manager called, www.firebobbradleynow.com. It seems most US fans aren’t too impressed with the 51-year-old's team selection, substitutions and defensive play – understandable in a nation that likes to see its sports teams on the attack. Even though Bradley has guided the country to the 2010 World Cup along with a 2-0 win over European Champions Spain in the 2009 Confederations Cup, the team has been playing well below par lately. They can also be thankful their World Cup group appears to be one of the easier ones with England, Algeria, and Slovenia as opponents. Most casual followers of US soccer probably don’t know too much about their coach, so to some it isn't quite obvious what all the fuss is about. Bradley hails from Montclair, New Jersey, and played high school and university football while growing up. He got into coaching shortly after when he was named manager of the men's team at Ohio University in 1981 when he was only 22. However, Bradley soon left when University of Virginia manager Bruce Arena came calling and headed to Virginia as Arena’s assistant for two years. He then returned to Princeton, where he played his university football, and took over as manager from 1984 to 1995. There Bradley won two Ivy League championships and made it to the NCAA final four in 1993. When Major League Soccer (MLS) was christened in 1996, Bradley hooked up with Arena and assisted him in managing DC United. They made a great pair and the Washington based side won the MLS Cup in the league’s first two seasons. Bradley then headed west in 1998 and became the first manager of the expansion team Chicago Fire. The club won the MLS Cup and US Open Cup double in its first year of existence and Bradley took home the MLS Coach of the Year award. He added to his trophy case in 2000 too when Chicago won the Open Cup, and was building an impressive reputation. Even though the coach was a hit in Chicago, Bradley left the club and took over in New York with the Metro Stars in the 2003 season. He found the going tougher there and was sacked in October 2005 with just three games left in the season. It didn’t take him long to find work though as he landed in Los Angeles to manage Chivas USA, who were heading into their second MLS season in 2006. The team improved and finished in third-place in the Western Conference before bowing out to the Houston Dynamo in the playoffs, with Bradley winning coach of the year again. But before he knew it, the US national side sacked his long time friend Arena and named Bradley as interim manager of the national team in December 2006 after its sub-par performance at that summer’s World Cup. It came as a bit of a surprise to many as former Germany manager and California resident Jurgen Klinsmann was rumoured to be a shoe-in for job. However, the team responded well to Bradley and he was officially named manager in May 2007. He paid back the soccer association by winning the 2007 Gold Cup with a 2-1 victory over Mexico and winning 12 games, drawing one and losing five. The US also went on a 10-game unbeaten streak which lasted over five months, but lost all three games in the 2007 Copa America tournament. The US played well in 2010 World Cup qualifying and beat Barbados 8–0 at home in the first round for the largest victory in the country's football history. In the summer of 2009, the US finished in second place in the Confederations Cup in South Africa after blowing a 2-0 lead and losing 3-2 to Brazil in the last few minutes of the game. They had though made it to the final by beating top-ranked Spain 2–0 and ended their opponent’s 35 game unbeaten and 15 game winning streaks. All in all it would have been hard for Bradley to do any better. There was no time to rest though, as the US entered the 2009 CONCACAF Gold Cup shortly after the Confederations Cup had finished. Most of the team’s players returned to their MLS clubs and a weakened American side was hammered 5-0 by arch rivals Mexico in the final. But even though the team’s regular players reassembled for the remaining World Cup qualifying games, they have struggled lately. The US were beaten by Mexico again in a 2010 qualifier and then squeaked out three one-goal wins and a draw in less than impressive fashion to reach South Africa. Since then, the Americans have lost 1-0 to Slovakia and 3-1 to Denmark in their latest warm-up matches. 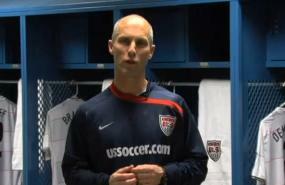 Bradley’s career won, lost, tied record with the US stands at 34-16-6. And as impressive as it is, critics will point out that they lost seven games between June and November in 2009. So, recent performances are indeed the crux of the matter, with many fans believing the team needs a change before heading to the World Cup next summer. Bradley’s name keeps popping up as American supporters hotly debate his use, or lack of use, of young Freddy Adu and trying to turn scoring machine Landon Donovan into a defensive player. It also doesn’t help that Bradley’s son, Michael, who plays with Borussia Monchengladbach, is now a regular with the national team. It’s hard for Bradley to play his son without the fans crying favouritism. The coach is also in a no-win situation when it comes to giving young players an opportunity to show what they can do for their country. Half the fans support his decision while the other half would rather see a more consistent lineup with established players. Whatever Bradley decides to do next, he won’t have much time to tinker with the squad as the US has just three more games lined up before the World Cup starts. It will be interesting to see if the firebobbradleynow website is still up after the United States' campaign in South Africa is at an end.